South Korean director Park Chan-wook, perhaps best known for his blood-spattered revenge opus Oldboy, is back with another wickedly entertaining piece of pulpy perfection. The Handmaiden is an engaging love story, a constantly revolving mystery and an intense psychological thriller all in one but above all, it’s a bold shot of uncompromised vivacity into the often lifeless landscape of world cinema. It’s possible that its 1930s setting paired with the two foreign languages that comprise the spoken material along with its lengthy runtime may cause some to view the film as a “challenge” to watch but thankfully, I found the total opposite to be the case instead. We are introduced to a young Korean pickpocket named Sook-hee (Kim Tae-ri) as she meets another con artist who goes by the name Count Fujiwara (Ha Jung-woo) and has a potentially profitable proposal in mind. He schemes to bring Sook-hee on as a maid for the wealthy and withdrawn Lady Hideko (Kim Min-hee) as a part of his plot to marry and then institutionalize the heiress to subsequently inherit her fortune. Plans go awry, however, when Sook-hee’s time with Hideko eventually manifests a passionate romance between the two and the roots of Sook-hee’s ruse slowly rot away. The story, an adaptation of the Victorian Era-set novel Fingersmith by Sarah Waters, is split into three distinct sections that each encapsulate the mindset of one of the film’s three main characters. This cleverly allows the audience to experience an event from an individual’s limited perspective and then reveal greater context to that same event later on through the eyes of a different character, which is even more integral to a movie that revolves around deception and romantic intrigue. 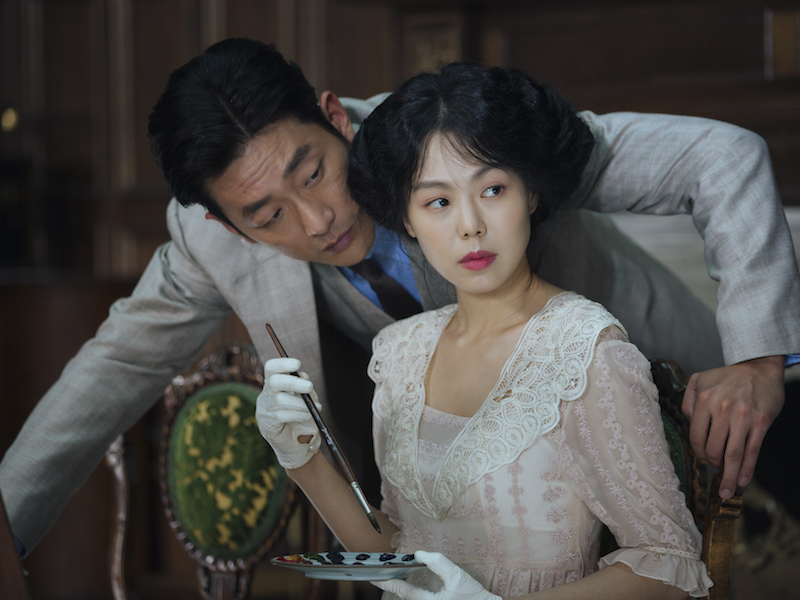 Where Oldboy hinged its story on one central mystery and its eventual reveal, The Handmaiden is steeped in more nuanced storytelling that embeds bits of meaning throughout instead of pulling the rug out from under us with one fell swoop. Chan-wook serves up his twisted and twisty narrative with a verve and vigor that’s equal parts playful and perverse, as bits of lighthearted physical comedy and shocking scenes of bold eroticism are interspersed with little advance warning. His high attention to detail is carried out at every level of production, from each ornate prop that’s utilized to the dazzling selection of vibrant costumes to the sumptuous sets that draw you in more at every turn. This meticulousness even applies to the performances as well: the manner in which a character eats her rice in one sequence, for instance, speaks to her exacting nature and with just that gesture, suggests that their may be even more to learn about her later in the story. Late in the film, one of the characters — himself a storyteller of sorts — facetiously remarks “the story is all about the journey” but no one has a greater affinity for this concept than Park Chan-wook. He crafts his films with layers and details that may not always be detectable within a first viewing but multiple visits tend to reveal greater depths and thus become more impressive over time. I have little doubt that The Handmaiden will perfectly fit within his pantheon of expertly crafted works that richly reward those who take the time to seek them out.